Yesterday’s game went alright. We started in the 3rd inning to finish the rained out game from tuesday. I didnt give up another run, but i looked bad. Not a lot of control, hung a lot, threw slow again, didnt feel comfortable… bleh. Here’s a side view. It doesnt seem i was able to correct much. I see a ton of problems I just dunno what to do about them. For instance, not getting enough push on my back leg. Or my glove arm still falling to my striding knee. 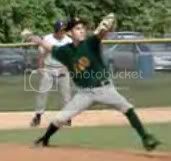 Then there is just the overall mechanics after I break my hands, and the timing of my throwing arm. 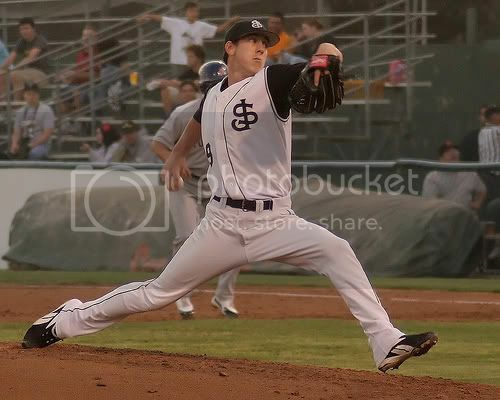 You can see, in comparison to Lincecum , I seem to get my arm up early still. What are way do you think I can maybe delay my arm? Or do I need not to? I noticed through watching videos that Lincecum doesnt get his arm in that position untill his hips have fully rotated and his shoulders begin to follow. Which you can clearly see in the stills of myself that my hips havent even begun to rotate. Any help or advice is appreciated, guys. I really don’t know if lincecum is the best person for comparison. I would compare your mechanics to an MLB veteran like Clemens Jonhson Glavine or Schilling. I think your mechanics look fine. But in my opinion your glove is to high when your other arm is up. yeah, you’re probably right. The reason it looks so awkward and messed up is probably because probably because my front shoulder and arm is up so high. Actually, in this case, comparing to Lincecum isn’t a bad thing because there is something that Lincecum does that you don’t and that is to get the hips going forward early and leading with the front hip futher into the stride. You don’t start your hips forward until the knee has peaked and is starting back down. Then you lean back a bit and reach with the front leg which also leads to the front leg opening up early. Try getting your hips moving (sideways) toward the plate a bit before the knee peaks. Lead with your front hip a bit longer by keeping the front foot slightly behind the front hip longer. Also make sure your head and shoulders stay slightly behind the front hip - no big lean back toward 2B. Well just because your arm isn’t as quick as lincecums, isn’t cause for alarm. He gets his arm going remarkebly late, and its because his action is simply lightning quick is the only reason he can get everything in sync after waiting so long. [quote=“Roger”]Actually, in this case, comparing to Lincecum isn’t a bad thing because there is something that Lincecum does that you don’t and that is to get the hips going forward early and leading with the front hip futher into the stride. You don’t start your hips forward until the knee has peaked and is starting back down. 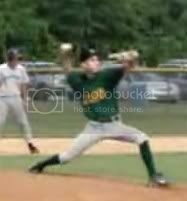 Then you lean back a bit and reach with the front leg which also leads to the front leg opening up early. now, if i lead more with my front hip and get it moving earlier it should allow me to get a lot more push with my back leg right? Which should lead to more mph? It will take a bit more of a push to initiate movement toward home plate sooner and faster. But I wouldn’t say that it allows you to get more push. It allows you to build more momentum which will actually pull the back foot off the rubber. This momentum is energy that can be transferred through the body and out to the ball possibly resulting in a few more mph. But getting that mph required harnessing the energy while moving faster. If the front leg isn’t strong enough to brace at foot plant, or the core isn’t strong enough to maintain posture and balance, or if good timing can’t be maintained, then the additional mph might not be achieved. [quote=“SP1B”]now, if i lead more with my front hip and get it moving earlier it should allow me to get a lot more push with my back leg right? Which should lead to more mph? Throwing a baseball 90mph repeatedly, is one of the most difficult things to do and maintain. Remember you don’t have to have perfect mechanics. If you find a successful way that you like and you pitch effectively like that then you can’t ask for too much more mechanic wise. The body is pretty good at figuring out the best ways to do things. But sometimes it takes some trial and error. And if you’ve received some incorrect instruction, that can prevent you from trying new and possibly better ways of doing things. Instruction offers the hope of getting to the best way of doing things faster than going down the trial and error path. And it can help you overcome those mental blocks from previous poor instruction. I hope to get lessons soon. Right now it looks like itll be from this place nearby called Hit and Run. I cant wait. If anyone is watching the college world series, did you here Oral talk about the pitcher’s Collapsing leg? Do you think I am doing that? And is he right what he is saying? Correct me if I am wrong, but the first 2 pitches were curveballs, and the last 2 fastballs?? Watch your throwing hand in your glove when you are throwing a off speed pitch. You dig to get it. Look at the last 2. No digging. Just dig for your pitches all the time, no matter curve, slider, change, or fastball. Why didn’t you throw from the stretch and attempt to throw the runner on 1st look at his monstrous lead.